At Briggs Tire Service, we stock a wide selection of wheels for customers in Washington, PA, Waynesburg, PA, Canonsburg, PA, and surrounding areas. Explore the many ways you can personalize your passenger vehicle with our wheel visualizer above. Enter your vehicle information to get started and see how different wheels look before you buy them. Our company sells custom wheels and wheel accessories for many applications, from passenger cars and light trucks to farm tractors. For medium trucks we sell Alcoa and Accuride wheels. We also offer the Alcoa Hub Cover System with screw-on Hug-A-Lugs®. We are an authorized Unverferth farm wheel dealer. We also sell Titan farm and implement wheels, as well as custom built AG wheels. Call (724) 267-3996 for more information or to order your wheels. 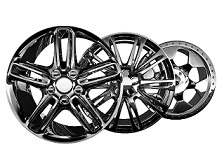 Before you start shopping for a new set of wheels, use our wheel buying guide, and consider the advantages and disadvantages of different wheel materials in order to find the best wheel to suit your needs. If you have any questions during your research, simply contact us online.